His Holiness teased the monks about whether they liked to rub the butter on their faces like Gen Rigzin Tenpa, one of his Kinnauri teachers, used to do. He added that this teacher was the only Tibetan Geshe to meet Mahatma Gandhi, when he was invited to serve as Hindi interpreter for a Tibetan delegation to India in 1947. Gandhi asked him about Buddhism and he gave him a brief explanation of the ‘Three Principal Aspects of the Path’. In his preamble to his reading from ‘Thirty-seven Practices of Bodhisattvas’, His Holiness talked about the University of Nalanda and the high degree of Sanskrit scholarship that flourished there. He recalled how forty years ago he invited a renowned Pandit, Upadhyaya, to recite the opening verses from Nagarjuna’s ‘Fundamental Wisdom’ and Chandrakirti’s ‘Entering into the Middle Way’ in Sanskrit for him. It moved him to reflect on the accomplishments of the great masters of the past, which have been all but forgotten in their land of origin. He also mentioned Atisha who was invited to Tibet by the King of Ngari and requested to compose a text that would be of benefit to the entire people of Tibet. The result was the ‘Lamp for the Path’. His Holiness mentioned that subsequently the Nyingma master Longchenpa composed his trilogy ‘On Comfort and Ease’ and the Kagyupa, Dagpo Lharje wrote his ‘Jewel Ornament of Liberation’. Ngulchu Thogme Sangpo’s composition of the text we’re reading took place in the same era. Resuming his reading at verse 7, His Holiness remarked that the real refuge is the Jewel of Dharma, because it is giving up the ten unwholesome actions that affords us real protection. The line ‘What worldly god can give you protection?’ prompted His Holiness to observe that the Five State Guardians, of which Nechung is one, are worldly gods. He went on to comment on the historical controversy associated with Shugden from the time of the Fifth Dalai Lama. “Drakpa Gyaltsen was close to the Fifth Dalai Lama, but problems emerged between them. Later, the Fifth Dalai Lama stated that Drakpa Gyaltsen was not the authentic reincarnation of Tulku Sonam Gelek Palzang. One volume of his writings refers to wrong prayers as having been the cause of Shugden, that his nature was that of a perfidious spirit and that his activity was to harm the Dharma and sentient beings. If someone were to deny the authority of the Fifth Dalai Lama they might challenge this—but I don’t think they can, can they? “Subsequently, it seems some people became complacent. By the time of Ngawang Chokden, a tutor to the Seventh Dalai Lama, who also became Ganden Tripa, there were lamas and tulkus propitiating Dolgyal. He put a stop to it and removed their cairns and so forth from within the bounds of Ganden Monastery. “Even later, during the time of the Thirteenth Dalai Lama there were again lamas propitiating this evil spirit, but there were also other lamas and scholars who staunchly opposed it. Trijang Rinpoche’s predecessor propitiated Dolgyal and so did Phabongka Rinpoche. In his early life, Phabongka was non-sectarian. Trijang Rinpoche told me that he remembered Phabongka preparing to make medicinal pills associated with the practice of Hayagriva. He was planning to receive certain Nyingma teachings, but Dolgyal put obstacles in his way. “Kyabje Phabongka was a great master of Lam Rim, but he took to propitiating Dolgyal out of fear. It’s not as if Dolgyal was ever oath-bound to protect the Dharma. In his younger days Phabongka was non-sectarian. He was favoured by the Thirteenth Dalai Lama, who called on him to teach instead of the Ganden Tripa, but he was displeased when Phabongka took up Dolgyal. He warned him that he risked breaching his refuge commitments. While the Thirteenth Dalai Lama was alive, Phabongka lived in fear. The Thirteenth used to write letters that he asked a trusted Geshe to deliver. It’s said that Phabongka would be scared when he heard the bells of this Geshe’s horse approaching. “At a certain point I too propitiated Dolgyal. Nechung advised me against it and I told him to keep quiet because so many people were involved. Once I’d decided to give it up I performed a dough ball divination to enquire if I should stop immediately or after the New Year—the answer was stop right away. “I was at Ganden later when I had a dream of one of my bodyguards telling me I needed to destroy the staff that was the support of Dolgyal’s life-force. I didn’t know whether it was significant. I was due to leave Ganden that day and went to the Assembly Hall where I performed a divination before Dharmaraja to establish whether it had anything to do with a statue of Dolgyal that had been placed there, whether it needed to be removed, and if so, whether it needed to be done soon, or whether it could wait until a planned renovation of the building took place. The answer was that the statue should be removed right away. I told the Ganden Abbots. “The Dolgyal people assert that I have done all this to flatter the Nyingmas, but that’s not so. I went on to Drepung where I was due to have lunch with Ling Rinpoche. I told him that I’d stirred things up that day. He asked what I’d done and I told him. He said it was good. “Trijang Rinpoche was away at the time, but when he returned I explained everything that had happened. His reply was that when it came to important issues Nechung had always proved infallible. When I left Lhasa we were surrounded by Chinese military. Nechung had advised us to stay at Norbulingka. The demonstrations of 10th March had taken place and by 17th March things were very tense. The Chinese had brought heavy weapons in, but covered them up. On 17th I consulted Nechung and he said, “Go, go tonight. Cross the Kyichu River, there’ll be no problem.” As Trijang Rinpoche pointed out, Nechung proved infallible. “The same can be said about Palden Lhamo, the protector of Tibet. Trijang Rinpoche told me that she is also infallibly reliable. Ling Rinpoche had nothing to do with Dolgyal, but Trijang Rinpoche did. I felt at ease because both my Tutors approved of what I had done. “The Dolgyal people say I have banned the practice, but from the start I have not said no one can do it. I have advised against it. Now members of Pompora Khamtsen in Sera have set up their own monastery. There is no ban, it’s up to the individual whether he or she does it or not. I’m being completely frank with you. On the other hand, there may be those who will try to persuade you that the practice will bring you success. Resuming his reading, His Holiness said we need to subdue our minds to avert preoccupation with the attractions of this or the next life. He said, “If you cherish others, you’ll have peace of mind, good health and long life. If you dwell on the divisive thought of ‘us’ and ‘them’, you’ll be lonely. But if you are kind and warm-hearted people will miss you and lament when you’re gone.” He referred to the practice of giving and taking and mentioned that he had visualized taking anger and aggression from Chinese officials and giving them love and affection at the time of demonstrations in Tibet and Lhasa in 2008. He said that it may not have had much effect on the ground, but it helped relieve his anxiety. His Holiness pointed out that up to verse 21 of the ‘Thirty-seven Practices’ deals with conventional bodhichitta, from verse 22 it deals with ultimate bodhichitta. At the end the author concludes with an expression of humility. 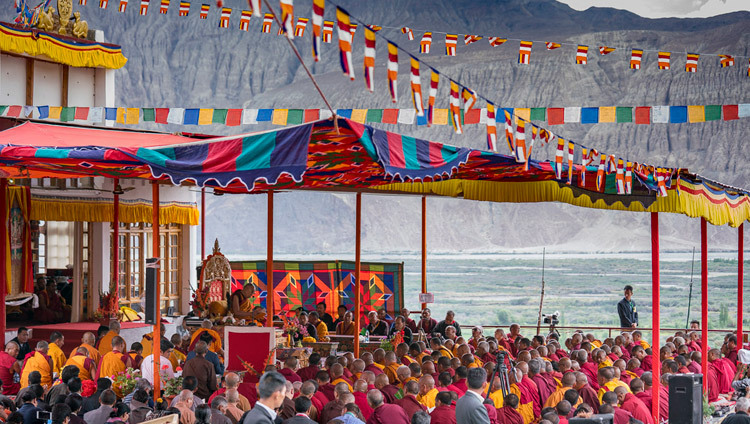 Taking up ‘Mitrayogi’s Three Essential Points’, His Holiness informed the audience that he had received a transmission of the root text, but not of the 2nd Dalai Lama’s commentary to it. However, he didn’t feel this prevented him from relying on it when he explained it. 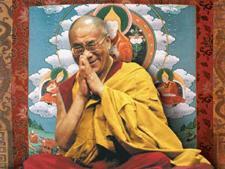 He reviewed the activities of the previous Dalai Lamas. He mentioned that the Second Dalai Lama regarded Tashi Lhunpo as his monastery, but went on to study at Drepung where he became Abbot. He also became Abbot of Sera. He recognised Lhamo Latso as associated with Palden Lhamo and established Chokhorgyal. He was steadfastly non-sectarian and came to be known as the non-sectarian Yellow-hat Lama. The Third Dalai Lama Sonam Gyatso was active in Mongolia, as a result of which the custom of rigorously studying the classic texts spread in that country. The Fourth Dalai Lama was born in Mongolia. The widespread accomplishments of the Fifth Dalai Lama were founded on the achievements of his predecessors. The Sixth may have been an accomplished master. The Seventh was not so clearly non-sectarian, but the Thirteenth, in association with his Tertön, Lerab Lingpa, composed a practice of Phurba or Varjakilaya. Consequently, Ling Rinpoche told His Holiness, the previous Gonpasar, in addition to his practice of Vajrabhairava also practised Vajrakilaya. His Holiness resumed reading ‘Mitrayogi’s Three Essential Points’, a guru yoga associated with the practice of Avalokiteshvara and the Second Dalai Lama’s commentary to it. He stressed the need to become thoroughly familiar with it in order to be able to recall it at the time of death and afterwards. He asked if anyone in the audience was able to practice lucid dreaming, remarking that if you can focus of the practices of bodhichitta and understanding of emptiness during the dream state it will have a powerful impact. “I saw you were here and wanted to meet you. I am just one among the 7 billion human beings alive today and wherever I go I try to make clear to others that in being human we are all the same. We belong to one family. In human history there has been a lot of trouble and violence because we tend to regard each other in terms of ‘us’ and ‘them’. We need instead to consider the oneness of humanity. When I meet people like you, I just think of myself as another human being, I don’t think about being a Buddhist, a Tibetan or the Dalai Lama, just a human being— and I find it’s easier to make friends that way. And I find that a smile is a true expression of friendship. “I’d like to share with you my vision for the world. I’m committed to promoting the oneness of humanity. As a Buddhist monk I feel it’s important to encourage inter-religious harmony as it flourishes here in India. All religions convey a common message of love and compassion and I’ve also come across many individual practitioners, Sadhus, Christian and Muslim teachers who are exemplary in the way they implement their practice. “As a Tibetan I have a responsibility towards the Tibetan people, but since 2011 I have retired from political involvement and have put a stop to future Dalai Lamas taking a political role too. I’m committed to speaking up for the protection of the Tibetan environment. On the one hand this is because the Tibetan Plateau is the source of Asia’s major rivers on which more than one billion people depend for water. On the other, I’m concerned that damage done to fragile environments at high altitude is more far-reaching and takes longer to restore. “I am also concerned to preserve Tibetan language, religion and culture. The traditions of logic and understanding of the workings of the mind and emotions that we derived from ancient India are something relevant that we can share with the world today. I feel it’s important to revive the knowledge of ancient India here in this country. Part of this involves mutually beneficial discussions I’ve been holding with scientists over the last thirty years and more. His Holiness also met with representatives of the Muslim community from Turtuk who had invited him to visit them. “I had hoped to take up your invitation,” he explained, “but unpredictable weather conditions made flying by helicopter difficult and the journey by road was considered impractical. As you know there was a thriving community of Ladakhi Muslims in Lhasa. They were very peaceable, we considered their food delicious and they spoke an enchantingly sweet Lhasa dialect. “After the September 11th tragedy, when people talked about Muslim terrorists, I defended the Muslim community. A year later at a commemoration service in the National Cathedral in Washington DC I said clearly that the impression was being put about that all Muslims were militant and that this was a mistake. In any country or faith there are people who make trouble. That is not an excuse to blacken an entire community. “In the last few years I’ve criticized the use of terms like Muslim Terrorist. After Buddhist monks in Burma harassed Muslims there, Time magazine ran a cover with a photograph of one of them and the caption ‘Buddhist Terrorist’. It made me uncomfortable, as I’m sure the term ‘Muslim Terrorist’ makes you. When someone engages in terrorism they cease to act like proper Muslims or Buddhist monks. They are just terrorists. “Last time I came to Turtuk, a Mullah told me that it’s against Islam to cause bloodshed. He added that a Muslim should have love for all the creatures of Allah, as well as clarifying that jihad is not so much about physical conflict as the inner struggle to tackle our disturbing emotions. From Disket His Holiness drove back up the broad Shyok River valley, crossed a bridge near the confluence and continued up the Nubra River to Samstanling Monastery above the village of Sumur. Local people again turned out to line the road and greet him as he passed. Ganden Trisur Rinpoche and Thiksey Rinpoche welcomed him to Samstanling and they sat and enjoyed tea together before His Holiness retired for the day. Tomorrow he will give a public teaching of Je Tsongkhapa’s ‘In Praise of Dependent Origination’.